What if the smart cities of the future are chock full of bugs? Robert De Niro as renegade smart-city hacker Harry Tuttle in Brazil (1985). Calafia Café in Palo Alto is one of the smartest eateries in the world. With Google’s former executive chef Charlie Ayers at the helm, the food here isn’t just for sustenance. This is California — eating is also a path to self-improvement. Each dish is carefully crafted with ingredients that not only keep you slim, but make you smarter and more energized too. A half-dozen venture capitalists pick at their dandelion salads. A sleepy suburb at night, by day Palo Alto becomes the beating heart of Silicon Valley, the monied epicenter of the greatest gathering of scientific and engineering talent in the history of human civilization. To the west, across the street, lies Stanford University. The Googleplex sprawls a few miles to the east. In the surrounding region, some half-million engineers live and work. A tech tycoon or two wouldn’t be out of place here. Steve Jobs was a regular. Excusing myself to the men’s room, however, I discover that Calafia Café has a major technology problem. Despite the pedigree of its clientele, the smart toilet doesn’t work. As I stare hopefully at the stainless steel throne, a red light peering out from the small black plastic box that contains the bowl’s “brains” blinks at me fruitlessly. Just above, a sign directs an escape path. “If sensor does not work,” it reads, “use manual flush button.” And so I bail out, sidestepping fifty years of progress in computer science and industrial engineering in the blink of an eye. Back at my table, I try to reverse-engineer the model of human-waste production encoded in the toilet’s CPU. I imagine a lab somewhere in Japan. Technicians in white lab coats wield stopwatches as they methodically clock an army of immodest volunteers seated upon row after row of smart johns. The complexity of the problem becomes clear. Is it supposed to flush as soon as you stand up? Or when you turn around? Or pause for a fixed amount of time? But how long? Can it tell if you need another flush? It’s not quite as challenging an engineering task as putting a man on the moon, or calculating driving directions to the airport. Somehow, though, that stuff works every time. My bewilderment quickly yields to a growing sense of dread. How is it that even in the heart of Silicon Valley it’s completely acceptable for smart technology to be buggy, erratic, or totally dysfunctional? Someone probably just cured cancer in the biotechnology lab across the street and is here celebrating over lunch. Yet that same genius will press the manual flush button just as I did, and never think twice about how consistently this new world of smart technology is letting us down. We are weaving these technologies into our homes, our communities, even our very bodies — but even experts have become disturbingly complacent about their shortcomings. The rest of us rarely question them at all. I know I should stop worrying, and learn to love the smart john. But what if it’s a harbinger of bigger problems? What if the seeds of smart cities’ own destruction are already built into their DNA? I’ve argued that smart cities are a solution to the challenges of 21st-century urbanization, that despite potential pitfalls, the benefits outweigh the risks, especially if we are aggressive about confronting the unintended consequences of our choices. But in reality we’ve only scratched the surface. What if the smart cities of the future are buggy and brittle? What are we getting ourselves into? A few weeks later, I found myself wandering around the MIT campus in Cambridge, Massachusetts, with nary a thought about uncooperative toilets in mind. Strolling west from Kenmore Square, a few minutes later I came across the new home of the Broad Institute, a monolith of glass and steel that houses a billion-dollar center for research in genomic medicine. The street wall was tricked out with an enormous array of displays showing in real time the endless sequences of DNA base pairs being mapped by the machinery upstairs. And then, out of the corner of my eye, I saw it. The Blue Screen of Death, as the alert displayed by Microsoft Windows following an operating-system crash is colloquially known. Forlorn, I looked through the glass at the lone panel. Instead of the stream of genetic discoveries, a meaningless string of hexadecimals stared back, indicating precisely where, deep in the core of some CPU, a lone miscomputation had occurred. Just where I had hoped to find historic fusion of human and machine intelligence, I’d found yet another bug. Since that day, bugs have become endemic in our digital world, the result of the enormous complexity and ruthless pace of modern engineering. But how will we experience bugs in the smart city? They could be as isolated as that faulty toilet or a crashed public screen. In 2007 a Washington Metro rail car caught fire after a power surge went unnoticed by buggy software designed to detect it. 6 Temporarily downgrading back to the older, more reliable code took just 20 minutes per car while engineers methodically began testing and debugging. The troubles of automation in transit systems are a precursor to the kinds of problems we’re likely to see as we buy into smart cities. As disconcerting as today’s failures are, however, they are actually a benchmark for reliability. Current smart systems are painstakingly designed and extensively tested. They have multiple layers of fail-safes. With the urgency of urban problems increasing and the resources and will to deal with them in doubt, in the future many smart technologies will be thrown together under tight schedules and even tighter budgets. They will struggle to match this gold standard of reliability, with only a few short-lived, sporadic glitches each year. The pervasiveness of bugs in smart cities is disconcerting. We don’t yet have a clear grasp of where the biggest risks lie, when and how they will cause systems to fail, or what the chain-reaction consequences will be. Who is responsible when a smart city crashes? And how will citizens help debug the city? Today, we routinely send anonymous bug reports to software companies when our desktop crashes. Is this a model that’s portable to the world of embedded and ubiquitous computing? Counterintuitively, buggy smart cities might strengthen and increase pressure for democracy. Wade Roush, who studied the way citizens respond to large-scale technological disasters like blackouts and nuclear accidents, concluded that “control breakdowns in large technological systems have educated and radicalized many lay citizens, enabling them to challenge both existing technological plans and the expertise and authority of the people who carry them out.” This public reaction to disasters of our own making, he argues, has spurred the development of “a new cultural undercurrent of ‘technological citizenship’ characterized by greater knowledge of, and skepticism toward, the complex systems that permeate modern societies.” 14 If the first generation of smart cities does truly prove fatally flawed, from their ashes may grow the seeds of more resilient, democratic designs. Let’s hope that’s just a story. Some days, it doesn’t feel so far-fetched. Jonathan Pryce and Robert De Niro in Brazil. Creation myths rely on faith as much as fact. The Internet’s is no different. Today, netizens everywhere believe that the Internet began as a military effort to design a communications network that could survive a nuclear attack. The fable begins in the early 1960s with the publication of “On Distributed Communications” by Paul Baran, a researcher at the RAND think tank. At the time, Baran had been tasked with developing a scheme for an indestructible telecommunications network for the U.S. Air Force. Cold War planners feared that the hub-and-spoke structure of the telephone system was vulnerable to a preemptive Soviet first strike. Without a working communications network, the United States would not be able to coordinate a counterattack, and the strategic balance of “mutually assured destruction” between the superpowers would be upset. What Baran proposed, according to Harvard University science historian Peter Galison, “was a plan to remove, completely, critical nodes from the telephone system.” 15 In “On Distributed Communications” and a series of pamphlets that followed, he demonstrated mathematically how a less centralized latticework of network hubs, interconnected by redundant links, could sustain heavy damage without becoming split into isolated sections. 16 The idea was picked up by the Pentagon’s Advanced Research Projects Agency (ARPA), a group set up to fast-track R&D after the embarrassment of the Soviet space program’s Sputnik launch in 1957. ARPANET, the Internet’s predecessor, was rolled out in the early 1970s. We also like to think that the Internet is still widely distributed as Baran envisioned, when in fact it’s perhaps the most centralized communications network ever built. In the beginning, ARPANET did indeed hew closely to that distributed ideal. 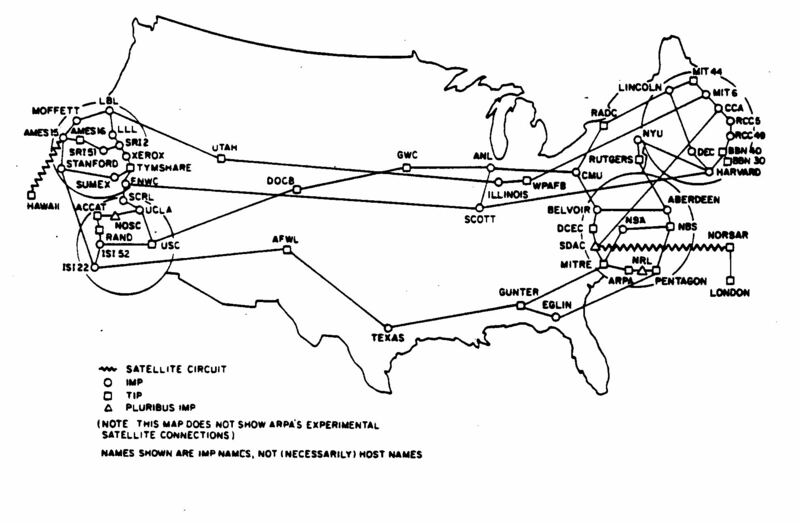 A 1977 map of the growing network shows at least four redundant transcontinental routes, run over phone lines leased from AT&T, linking up the major computing clusters in Boston, Washington, Silicon Valley, and Los Angeles. Metropolitan loops created redundancy within those regions as well. 19 If the link to your neighbor went down, you could still reach them by sending packets around in the other direction. This approach is still commonly used today. By 1987, the Pentagon was ready to pull the plug on what it had always considered an experiment. But the research community was hooked, so plans were made to hand over control to the National Science Foundation, which merged the civilian portion of the ARPANET with its own research network, NSFNET, launched a year earlier. In July 1988, NSFNET turned on a new national backbone network that dropped the redundant and distributed grid of ARPANET in favor of a more efficient and economical hub-and-spoke arrangement. 20 Much like the air-transportation network today, consortia of universities pooled their resources to deploy their own regional feeder networks (often with significant NSF funding), which linked up into the backbone at several hubs scattered strategically around the country. Despite the existence of many chokepoints, the Internet’s nuke-proof design creation myth has only been strengthened by the fact that the few times it has actually been bombed, it has proven surprisingly resilient. During the spring 1999 aerial bombardment of Serbia by NATO, which explicitly targeted telecommunications facilities along with the power grid, many of the country’s Internet Protocol networks were able to stay connected to the outside world. 22 And the Internet survived 9/11 largely unscathed. Some 3 million telephone lines were knocked out in lower Manhattan alone — a grid the size of Switzerland’s — from damage to a single phone-company building near the World Trade Center. Broadcast radio and TV stations were crippled by the destruction of the north tower, whose rooftop bristled with antennas of every size, shape, and purpose. Panic-dialing across the nation brought the phone system to a standstill. 23 But the Internet hardly blinked. But while the Internet manages to maintain its messy integrity, the infrastructure of smart cities is far more brittle. As we layer ever more fragile networks and single points of failure on top of the Internet’s still-resilient core, major disruptions in service are likely to be common. And with an increasing array of critical economic, social, and government services running over these channels, the risks are compounded. The greatest cause for concern is our growing dependence on untethered networks, which puts us at the mercy of a fragile last wireless hop between our devices and the tower. Cellular networks have none of the resilience of the Internet. They are the fainting ladies of the network world — when the heat is on, they’re the first to go down and make the biggest fuss as they do so. The biggest threat to cellular networks in cities, however, is population density. Because wireless carriers try to maximize the profit-making potential of their expensive spectrum licenses, they typically only build out enough infrastructure to connect a fraction of their customers in a given place at the same time. “Oversubscribing,” as this carefully calibrated scheme is known in the business, works fine under normal conditions, when even the heaviest users rarely chat for more than a few hours a day. But during a disaster, when everyone starts to panic, call volumes surge and the capacity is quickly exhausted. On the morning of September 11, for instance, fewer than 1 in 20 mobile calls were connected in New York City. 26 A decade later, little has changed. During a scary but not very destructive earthquake on the U.S. East Coast in the summer of 2011, cell networks were again overwhelmed. Yet media reports barely noted it. Cellular outages during crises have become so commonplace in modern urban life that we no longer question why they happen or how the problem can be fixed. The cloud is far less reliable than most of us realize, and its fallibility may be starting to take a real economic toll. Google, which prides itself on high-quality data-center engineering, suffered a half-dozen outages in 2008 lasting up to 30 hours. 30 Amazon promises its cloud customers 99.5 percent annual uptime, while Google pledges 99.9 percent for its premium apps service. That sounds impressive until you realize that even after years of increasing outages, even in the most blackout-prone region (the Northeast), the much-maligned American electric power industry averages 99.96 percent uptime. 31 Yet even that tiny gap between reality and perfection carries a huge cost. According to Massoud Amin of the University of Minnesota, power outages and power quality disturbances cost the U.S. economy between $80 billion and $188 billion a year. 32 A back-of-the-envelope calculation published by International Working Group on Cloud Computing Resiliency tagged the economic cost of cloud outages between 2007 and mid-2012 at just $70 million (not including the July 2012 Amazon outage). 33 But as more and more of the vital functions of smart cities migrate to a handful of big, vulnerable data centers, this number is sure to swell in coming years. Cloud-computing outages could turn smart cities into zombies. Biometric authentication, for instance, which senses our unique physical characteristics to identify individuals, will increasingly determine our rights and privileges as we move through the city — granting physical access to buildings and rooms, personalizing environments, and enabling digital services and content. But biometric authentication is a complex task that will demand access to remote data and computation. The keyless entry system at your office might send a scan of your retina to a remote data center to match against your personnel record before admitting you. Continuous authentication, a technique that uses always-on biometrics — your appearance, gestures, or typing style — will constantly verify your identity, potentially eliminating the need for passwords. 34 Such systems will rely heavily on cloud computing, and will break down when it does. It’s one thing for your e-mail to go down for a few hours, but it’s another thing when everyone in your neighborhood gets locked out of their homes. Siemens SIMATIC control panel for a SCADA system like those targeted by the Stuxnet virus. Stuxnet’s unique attributes aside, most embedded systems aren’t located in bunkers, and they are increasingly vulnerable to much simpler attacks on their human operators. Little more than a year after Stuxnet was uncovered, a lone hacker known only as “pr0f” attacked the water utility of South Houston, a small town of 17,000 people just outside Texas’s most populous city. Enraged by the U.S. government’s downplaying of a similar incident reported in Springfield, Illinois, pr0f homed in on the utility’s Siemens SIMATIC software, a web-based dashboard for remote access to the waterworks’ SCADA systems. While the Springfield attack turned out to be a false alarm — federal officials eventually reported finding “no evidence of a cyber intrusion” — pr0f was already on the move, and the hacker didn’t even need to write any code. 44 It turned out that the plant’s operators had chosen a shockingly weak three-letter password. While pr0f’s attack on South Houston could have easily been prevented, SIMATIC is widely used and full of more fundamental vulnerabilities that hackers can exploit. That summer Dillon Beresford, a security researcher at (oddly coincidentally) Houston-based network security outfit NSS Labs, had demonstrated several flaws in SIMATIC and ways to exploit them. Siemens managed to dodge the collateral damage of Stuxnet, but the holes in SIMATIC are indicative of far more serious risks it must address. Another troubling development is the growing number of “forever day” vulnerabilities being discovered in older control systems. Unlike zero-day exploits, for which vendors and security firms can quickly deploy countermeasures and patches, forever-day exploits target holes in legacy embedded systems that manufacturers no longer support — and therefore will never be patched. The problem affects industrial-control equipment sold in the past by both Siemens and GE, as well as a host of smaller firms. 45 It has drawn increased interest from the Cyber Emergency Response Team, the government agency that coordinates American cyber-security efforts. Screenshot posted by the hacker who penetrated a South Houston, Texas, water utility control system in 2011. If the history of city building in the last century tells us anything, it is that the unintended consequences of new technologies often dwarf their intended design. Motorization promised to save city dwellers from the piles of horse manure that clogged 19th-century streets and deliver us from a shroud of factory smoke back to nature. Instead, it scarred the countryside with sprawl and rendered us sedentary and obese. If we don’t think critically now about the technology we put in place for the next century of cities, we can only look forward to all the unpleasant surprises they hold in store for us. Smart cities are almost guaranteed to be chock full of bugs, from smart toilets and faucets that won’t operate to public screens sporting Microsoft’s ominous Blue Screen of Death. But even when their code is clean, the innards of smart cities will be so complex that so-called normal accidents will be inevitable. The only questions will be when smart cities fail, and how much damage they cause when they crash. Layered atop the fragile power grid, already prone to overload during crises and open to sabotage, the communications networks that patch the smart city together are as brittle an infrastructure as we’ve ever had. But that’s only if we continue doing business as usual. We can stack the deck and improve the odds, but we need to completely rethink our approach to the opportunities and challenges of building smart cities. We need to question the confidence of tech-industry giants, and organize the local innovation that’s blossoming at the grassroots into a truly global movement. We need to push our civic leaders to think more about long-term survival and less about short-term gain, more about cooperation than competition. Most importantly, we need to take the wheel back from the engineers, and let people and communities decide where we should steer. People often ask me, “What is a smart city?” It’s a hard question to answer. “Smart” is a problematic word that has come to mean a million things. Soon, it may take its place alongside the handful of international cognates — vaguely evocative terms like “sustainability” and “globalization” — that no one bothers to translate because there’s no consensus about what they actually mean. When people talk about smart cities, they often cast a wide net that pulls in every new public-service innovation from bike sharing to pop-up parks. 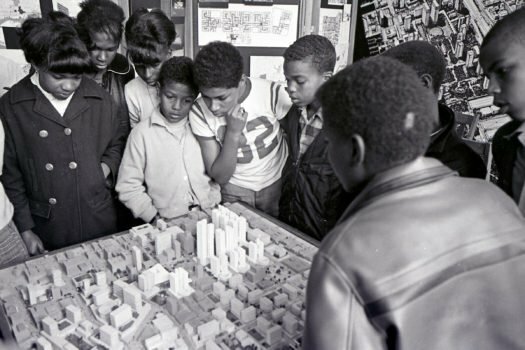 The broad view is important, since cities must be viewed holistically. Simply installing some new technology, no matter how elegant or powerful, cannot solve a city’s problems in isolation. But there really is something going on here — information technology is clearly going to be a big part of the solution. It deserves treatment on its own. I take a more focused view and define smart cities as places where information technology is combined with infrastructure, architecture, everyday objects, and even our bodies to address social, economic, and environmental problems. I think the more important and interesting question is, “what do you want a smart city to be?” We need to focus on how we shape the technology we employ in future cities. There are many different visions of what the opportunity is. Ask an IBM engineer and he will tell you about the potential for efficiency and optimization. Ask an app developer and she will paint a vision of novel social interactions and experiences in public places. Ask a mayor and it’s all about participation and democracy. In truth, smart cities should strive for all of these things. There are trade-offs between these competing goals for smart cities. The urgent challenge is weaving together solutions that integrate these aims and mitigate conflicts. Smart cities need to be efficient but also preserve opportunities for spontaneity, serendipity, and sociability. If we program all of the randomness out, we’ll have turned them from rich, living organisms into dull mechanical automatons. They need to be secure, but not at the risk of becoming surveillance chambers. They need to be open and participatory, but provide enough support structure for those who lack the resources to self-organize. More than anything else, they need to be inclusive. In her most influential book, The Death and Life of Great American Cities, the acclaimed urbanist Jane Jacobs argued that “cities have the capability of providing something for everybody, only because, and only when, they are created by everybody.” 51 Yet over fifty years later, as we set out to create the smart cities of the 21st century, we seem to have again forgotten this hard-learned truth. But there is hope that a new civic order will arise in smart cities, and pull every last one of us into the effort to make them better places. Cities used to be full of strangers and chance encounters. Today we can mine the social graph in an instant by simply taking a photo. Algorithms churn in the cloud, telling the little things in our pocket where we should eat and whom we should date. It’s a jarring transformation. But even as old norms fade into the past, we’re learning new ways to thrive on mass connectedness. A sharing economy has mushroomed overnight, as people swap everything from spare bedrooms to cars, in a synergistic exploitation of new technology and more earth-friendly consumption. Online social networks are leaking back into the thriving urban habitats where they were born in countless promising ways. For the last 15 years, I’ve watched the struggle over how to build smart cities evolve from the trenches. I’ve studied and critiqued these efforts, designed parts of them myself, and cheered others along. I’ve written forecasts for big companies as they sized up the market, worked with start-ups and civic hackers toiling away at the grass roots, and advised politicians and policy wonks trying to push reluctant governments into a new era. I understand and share much of their agendas. But I’ve also seen my share of gaps, shortfalls, and misguided assumptions in the visions and initiatives that have been carried forth under the banner of smart cities. And so I’m going to play the roles of myth buster, whistle-blower, and skeptic in one. The technology industry is asking us to rebuild the world around its vision of efficient, safe, convenient living. It is spending hundreds of millions of dollars to convince us to pay for it. But we’ve seen this movie before. As essayist Walter Lippmann wrote of the 1939 World’s Fair, “General Motors has spent a small fortune to convince the American public that if it wishes to enjoy the full benefit of private enterprise in motor manufacturing, it will have to rebuild its cities and its highways by public enterprise.” 51 Today the computer guys are singing the same song. I believe there is a better way to build smart cities than to simply call in the engineers. We need to lift up the civic leaders who would show us a different way. We need to empower ourselves to build future cities organically, from the bottom up, and do it in time to save ourselves from climate change. If that seems an insurmountable goal, don’t forget that at the end of the day the smartest city in the world is the one you live in. If that’s not worth fighting for, I don’t know what is. “Smart Cities” is adapted from Smart Cities: Big Data, Civic Hackers, and the Quest for a New Utopia, copyright © Anthony M. Townsend, published this month by W.W. Norton & Company. It appears with the permission of the author and publisher. J. Casale, “The Origin of the Word ‘Bug,’” The OTB (Antique Wireless Association), February 2004. Thomas P. Hughes, American Genesis: Genesis: A History of the American Genius for Invention (New York: Penguin Books, 1989), 75. William Maver Jr. and Minor M. Davis, The Quadruplex (New York: W. J. Johnston, 1890), 84. Naval History and Heritage Command archives, Photo 96566-KN. Kathleen Broome Williams, Grace Hopper: Admiral of the Cyber Sea (Annapolis, MD: Naval Institute Press, 2004), 54. “Surge Caused Fire in Rail Car,” Washington Times, April 12, 2007. “About recent service interruptions, what we’re doing to prevent similar problems in the future,” Bay Area Rapid Transit District. “The Economic Impact of Interrupted Service,” 2010 U.S. Transportation Construction Industry Profile (Washington, DC: American Road & Transportation Builders Association, 2010). Quentin Hardy, “Internet Experts Warn of Risks in Ultrafast Networks,” New York Times, November 13, 2011, B3. Ellen Ullman, “Op-Ed: Errant Code? It’s Not Just a Bug,” New York Times, August 8, 2012. Charles Perrow, Normal Accidents: Living with High–Risk Technologies (Princeton, NJ: Princeton University Press, 1999), 4. Robert L. Mitchell, “Y2K: The good, the bad and the ugly,” Computerworld, December 28, 2009. David Green, “Computer Glitch Summons Too Many Jurors,” National Public Radio, May 3, 2012. Wade Roush, “Catastrophe and Control: How Technological Disasters Enhance Democracy,” PhD dissertation, Program in Science, Technology and Society, Massachusetts Institute of Technology, 1994. Peter Galison, “War Against the Center,” Grey Room, no. 4 (2001): 26. Paul Baran, On Distributed Communications (RAND: Santa Monica, CA, 1964), document no. RM-3420-PR . Barry M. Leiner et al., “Brief History of the Internet”, n.d., , accessed August 29, 2012. It was the First ACM Symposium on Operating Systems Principles. Bob Taylor, October 6, 2004, e-mail to Dave Farber reposted to INTERESTINGPEOPLE listserv. 1977 geographical map of ARPANET, originally published in F. Heart, A. McKenzie, J. McQuillian, and D. Walden, ARPANET Completion Report (Bolt, Beranek and Newman, Burlington, MA), January 4, 1978. Suzanne Harris and Amy Hansen, “The Internet: Changing the Way We Communicate,” America’s Investment in the Future, National Science Foundation, n.d.
Marjorie Censer, “After Dramatic Growth, Ashburn Expects Even More Data Centers,” Washington Post, August 27, 2011. Steven Branigan and Bill Cheswick, “The effects of war on the Yugoslavian Network,” 1999. William J. Mitchell and Anthony M. Townsend, “Cyborg Agonistes,” in The Resilient City: How Modern Cities Recover From Disaster, edited by Lawrence J. Vale and Thomas J. Campanella (New York: Oxford University Press, 2005), 320–21. New York State Public Service Commission, unpublished documents provided to the author. Martin Fackler, “Quake Area Residents Turn to Old Means of Communication to Keep Informed,” New York Times, March 28, 2011, A11. National Research Council, Computer Science and Telecommunications Board, The Internet Under Crisis Conditions: Learning From September 11 (Washington, DC: National Academies Press, 2003). Amazon Web Services, “Summary of the Amazon EC2 and Amazon RDS Service Disruption,” April 29, 2011. Chloe Albanesius, “Amazon Blames Power, Generator Failure for Outage,” PCMag.com, July 3, 2012. Christina DesMarais, “Amazon Cloud Hit by Real Clouds, Downing Netflix, Instagram, Other Sites,” PCWorld, June 30, 2012. J. R. Raphael, “Gmail Outage Marks Sixth Downtime in Eight Months,” PCWorld, February 24, 2009. Author’s calculation based on statistics reported in Massoud Amin, “U.S. Electrical Grid Gets Less Reliable,” IEEE Spectrum, January 2011. Massoud Amin, “The Rising Tide of Power Outages and the Need for a Stronger and Smarter Grid,” Security Technology, Technological Leadership Institute, University of Minnesota, October 8, 2010. Maurice Gagnaire et al., “Downtime statistics of current cloud solutions,” International Working Group on Cloud Computing Resiliency, June 2012. Kathleen Hickey, “DARPA : Dump Passwords for Always-on Biometrics,” Government Computer News, March 21, 2012. Global Positioning System: Significant Challenges in Sustaining and Upgrading Widely Used Capabilities (US Government Accountability Office: Washington, DC), GAO-09-670T, May 7, 2009. Global Navigation Space Systems: Reliance and Vulnerabilities (London: Royal Academy of Engineering, 2011), 3. “Scientists Warn of ‘Dangerous Over-reliance on GPS,’” The Raw Story, March 8, 2011, . “BufferBloat: What’s Wrong with the Internet?” ACMQueue, December 7, 2011, . Jim Gettys and Kathleen Nichols, “Bufferbloat: Dark Buffers in the Internet,” ACMQueue, November 29, 2011. Ellen Nakashima and Joby Warrick, “Stuxnet was work of U.S. and Israeli experts, officials say,” Washington Post, June 1, 2012. Vivian Yeo, “Stuxnet infections spread to 115 countries,” ZDNet, August 9, 2010. Elinor Mills, “Ralph Langer on Stuxnet, copycat threats (Q&A),” CNet News, May 22, 2011. Symantec Corporation, “W32.Stuxnet,” Security Responses. Dan Goodin, “FBI: No evidence of water system hack destroying pump,” The Register, November 23, 2011. Goodin, “Rise of ‘forever day’ bugs in industrial systems threatens critical infrastructure,” Ars Technica, April 9, 2012. Ellen Nakashima, “Cyber-intruder sparks massive federal response—and debate over dealing with threats,” Washington Post, December 8, 2011. Mark Ward, “Warning Over Medical Implant Attacks,” BBC News, April 10, 2012; Daniel Halperin et al., “Pacemakers and Implantable Cardiac Defibrillators: Software Radio Attacks and Zero-Power Defenses,” proceedings of the 2008 IEEE Symposium on Security and Privacy. Colin Harrison, interview by author, May 9, 2011. Chul-jae Lee and Gwang-li Moon, “Incheon Airport cyberattack traced to Pyongyang,” Korea JoongAng Daily, June 5, 2012. David E. Sanger, “Obama Order Sped Up Wave of Cyberattacks Against Iran,” New York Times, June 1, 2012, A1. Jane Jacobs, The Death and Life of Great American Cities (New York: Random House, 1961), 238. 52. Walter Lippmann, New York Herald Tribune, June 6, 1939, quoted in Robert W. Rydell, World of Fairs: The Century-of-Progress Expositions (Chicago: University of Chicago Press, 1993), 115. Thanks for this article. It offers some interesting ballast to what is otherwise a pretty frothy conversation in the fields related to urban design (this year's Ed Bacon competition is a good example). This concept of efficiency comes up a few times and is something I've been wondering about more lately. It seems to be another in that category of sustainability, globalization and smart that is super vague and generally taken as a good thing. For instance you provide that great illustration of cell phone towers and over-subscription. That could be understood as a highly efficient system in some ways. But a lot of non-human environments are actually incredibly wasteful and excessive and it is that fact which calls forth novelty and possibility. I was wondering if you see some alternative ways of conceptualizing real processes and functions as we move to embed information technologies in our infrastructure and cities? As beguiling as sentient toilets and biometric everything may be just how much is actually helping and how much is the result of slick sales, smart for the sake of being smart whatever that might mean to the beholder? Take for example IBM's Smarter Cities (this is not intended as a slight on the company). The advertising and positioning is powerful and reassuring. Dig a little deeper and it appears that what is really being sold is not is much solutions to underlying problems but software salves for symptoms of sickly urban design and poor planning. In the short run they may not be simple nor cheap to remedy. But in the long run smart salves may not only cost more but leave trouble to fester raising the prospect of bigger problems down the road. This is not to say that there is no role for smart (sense, interpret, act?) systems nor that in the short term at least smart approaches might provide valuable relief. The danger perhaps is that the smart salve seduces with its mesmerising efficiency, it becomes the solution, not to the problem of the city, but to the problem of quick-fix sound-bite here-today-gone-tomorrow politics. Setting such concerns aside an arguably more fundamental issue remains. Consider for example the sentient toilet or wash basin. Hands-free pseudo convenience. Each sensor requires energy and materials to manufacture, additional installation work, electricity and maintenance during operatic and finally disposal. Compare that to the energy and material cost of the traditional option using a hand. Granted those sensors might reduce water consumption but whether that outweighs their lifetime environmental impact is hard to take at face value. Moreover money spent on such systems in all sorts of places - and the associated and hidden interdependencies - might be spent just effectively on psychological tweaks to design to nudge us towards preferred behaviours. There are many ways for a city to be smart without reflexively resorting to chips and code. Well, at least for cities the purpose of which is to provide a stage for the idiosyncrasies and imperfections which make denizens rich in humanity and give the city soul. Anthony Townsend is an urban planner and forecaster. He is Research Director at the Institute for the Future and Senior Research Fellow at New York University’s Rudin Center for Transportation. Read more on Places from books published by W. W. Norton.